Botany: Harītakī is a medium to large deciduous tree attaining a height of up to 30 m, with widely spreading branches and a broad roundish crown. The leaves are elliptic-oblong, with an acute tip, cordate at the base, margins entire, glabrous above with a yellowish pubescence below. The flowers are monoecious, dull white to yellow, with a strong unpleasant odour, borne in terminal spikes or short panicles. The fruits are glabrous, ellipsoid to ovoid drupes, yellow to orange brown in colour, containing a single angled stone. Harītakī is found throughout deciduous forests of the Indian subcontinent, on dry slopes up to 900 meters in elevation (Kirtikar & Basu 1935, Warrier et al 1996). Part used: Fruit; seven types are recognized (i.e. vijayā, rohiṇī, pūtanā, amṛta, abhayā, jīvantī and cetakī), based on the region the fruit is harvested, as well as the colour and shape of the fruit. 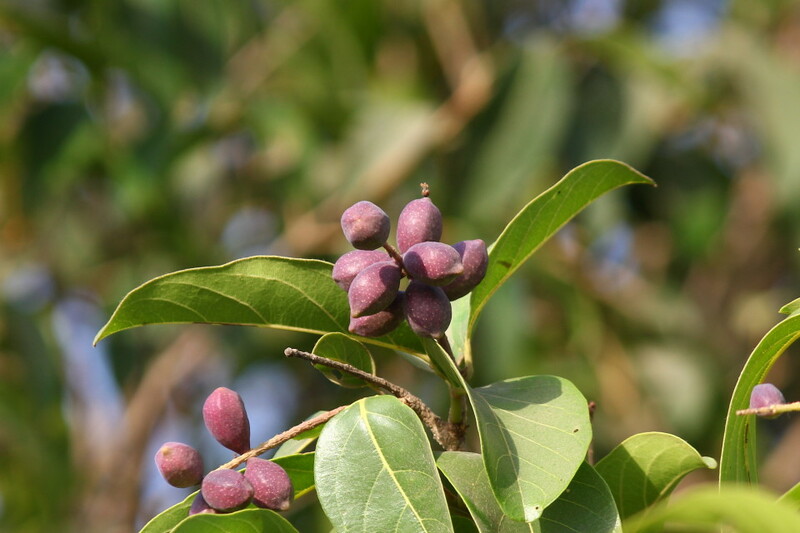 Generally speaking the vijayā variety is preferred, which is traditionally grown in the Vindhya mountain range of central India, and has a roundish as opposed to a more angular shape (Srikanthamurthy 2001). Constituents: Researchers have isolated a number of glycosides from Harītakī, including the triterpenes arjunglucoside I, arjungenin, and the chebulosides I and II. Other constituents include a coumarin conjugated with gallic acids called chebulin, as well as other phenolic compounds including ellagic acid, 2,4-chebulyl-b-D-glucopyranose, chebulinic acid, gallic acid, ethyl gallate, punicalagin, terflavin A, terchebin, luteolin, and tannic acid (Creencia et al 1996, Kapoor 1990, Saleem et al 2002, Williamson 2002, Yoganarasimhan 2000). • Human trials: a mouth rinse prepared with a 10% solution of Harītakī siginificantly inhibited salivary bacterial counts (Jagtap & Karkera 1999). Toxicity: Feeding trials in rats with Terminalia chebula produced hepatic lesions that included central vein abnormalities and marked renal lesions (Arseculeratne et al 1985). This same study also suggested that Withania somnifera produces similar renal lesions, an effect that has not been observed in any other studies. Given the long history of usage and popularity of Harītakī, this single study cannot be reliably extrapolated to human usage. Indications: Gingivitis, stomatitis, asthma, cough, dyspnea, dyspepsia, gastroenteritis, ulcers, diarrhoea, constipation, IBS, hemorrhoids, candidiasis, parasites, malabsorption syndromes, biliousness, hepatomegaly, splenomegaly, ascites, vesicular and renal calculi, urinary discharges, tumors, skin diseases, leprosy, intermittent fever, rheumatism, arthritis, gout, neuropathy, paralysis, memory loss, epilepsy, depression, leucorrhea, diabetes, cardiovascular disease, anorexia, wounds. Contraindications: Pregnancy, dehydration, emaciation, pittakopa (Frawley & Lad 1985). Caraka indicates that Harītakī is contraindicated in weak digestion, fatigue due to excessive sexual activity, with alcoholic drinks, and in hunger, thirst and heat stroke (Sharma and Dash 1988). Medicinal uses: The Sanskrit name Harītakī is rich with meaning, referring to the yellowish dye (harita) that it contains, as well as indicating that it grows in the abode of the god Śiva (Hari, i.e. the Himalayas), and that it cures (hārayet) all disease (Dash 1991). Its other commonly used Sanskrit name, Abhayā, refers to the ‘fearlessness’ it provides in the face of disease. According to the Bhāvaprakāśa, Harītakī is derived from a drop of nectar from Indra’s cup, similar to Guḍūcī (Srikanthamurthy 2001). Although the fresh fruit is difficult to obtain in the West, the fruit can be reconstituted by simmering in water and used in a similar fashion. Above all, Harītakī is considered to mitigate vāta and eliminate āma, the latter indicated by constipation, a thick greyish tongue coating, abdominal pain and distension, foul feces and breath, flatulence, weakness, and a slow pulse. The fresh fruit is dīpana and the powdered dried fruit made into a paste and taken with jaggery is malaśodhana, removing impurities and wastes from the body. Harītakī is an efficacious purgative when taken as a powder, but when the whole dried fruit is boiled the resulting decoction is grāhī, useful in the treatment of diarrhea and dysentery. The fresh or reconstituted fruit fried in ghṛta and taken before meals is dīpanapācana. If this latter preparation is taken with meals it increases buddhi (‘intellect’), nourishes the indriyāṇi (‘senses’) and is mutrāmalaśodhana (purifies the digestive and genitourinary tract). Taken after meals, Harītakī “quickly cures diseases caused by the aggravation of vāyu, pitta and kapha as a result of unwholesome food and drinks” (Dash 1991). Harītakī is a rasāyana to vāta, increasing awareness, and has a nourishing, restorative effect on the central nervous system. Harītakī improves digestion, promotes the absorption of nutrients, and regulates colon function. Harītakī is very useful in prolapsed organs, improving the strength and tone of the supporting musculature. It may be taken with other hepatic restoratives such as Haridrā or Dāruharidrā, and with carminatives such as Elā or Ajamodā in dyspepsia and biliousnes. In gastrointestinal candidiasis it may be taken along with Haridrā, Barberry root (Berberis vulgaris), Pau D’Arco (Tabebuia avellanedae), or used by itself for this purpose. In cases of gastroenteritis and dysentery four parts Harītakī may be decocted with two parts Dhānyaka seed, two parts Śātapuṣpā seed, one part Ajamodā seed, one part Śūṇṭhī rhizome, and one part Yaṣṭimadhu for prompt relief. In the treatment of piles and vaginal discharge, a decoction of Harītakī may be used an antiseptic and astringent wash (Nadkarni 1954). A fine paste of the powder may be applied on burns and scalds (Nadkarni 1954). A cold infusion of Harītakī is an effective mouth rinse and the powder a good dentifrice in the treatment of apthous stomatitis, periodentitis, and dental caries (Kirtikar & Basu 1935, Nadkarni 1954). In the treatment of sciatica, lumbago and general lower back pain Harītakī may be combined with Guggulu, Black Cohosh (Cimicifuga racemosa rhizome), Pippalī, Elā and Tvak bark. In combination with Guggulu, Harītakī is useful in the treatment of gout. Harītakī is the primary constituent of Agastya Rasāyana leha (confection), formulated by the sage Agastya, father of the Siddha school of medicine. It is an excellent formula to improve digestion, remove waste and impurities from the body, and stimulate the regeneration of tissues, although the taste may prove to be a challenge for many Westerners. Harītakī is perhaps best known as a constituent of the formula Triphalā, usually containing equal proportions of Harītakī, Bibhītaka and Āmalakī. • Cūrṇa: 1-10 g b.i.d.-t.i.d. • Kvātha: 30-120 ml b.i.d.-t.i.d. • Tincture: 1:5, 30% alcohol, 1-5 ml b.i.d.-t.i.d.